This is one of the big dirty secrets of Wall Street that former Federal Reserve Chair Alan Greenspan promoted. Sadly Greenspan is now talking down the US dollar and working for foreign governments against the interests of the United States. It is vitally important that the Federal Reserve get on top of this money market truth in labelling endeavor immediately, otherwise, confidence can be lost. Schwab will argue that these investments are secured by underlying government securities at the various financial insitutions yet that introduces a whole new set of undisclosed risk factors. Regarding Citigroup, even its most recent investors in the middle east have stated that they will not bail them out. Why should they when they now hold convertible bonds and in the case of bankrupty these investors can essentially take over the entire organization, leaving ordinary common stock shareholders with nothing. Fixing this money market situation will also allow a more level competitive field in which fund companies can offer government money markets that do actually contain securities backed directly by the US government, not collateralized investments, and effectively compete with funds that are aggressively marketed by Schwab and others. 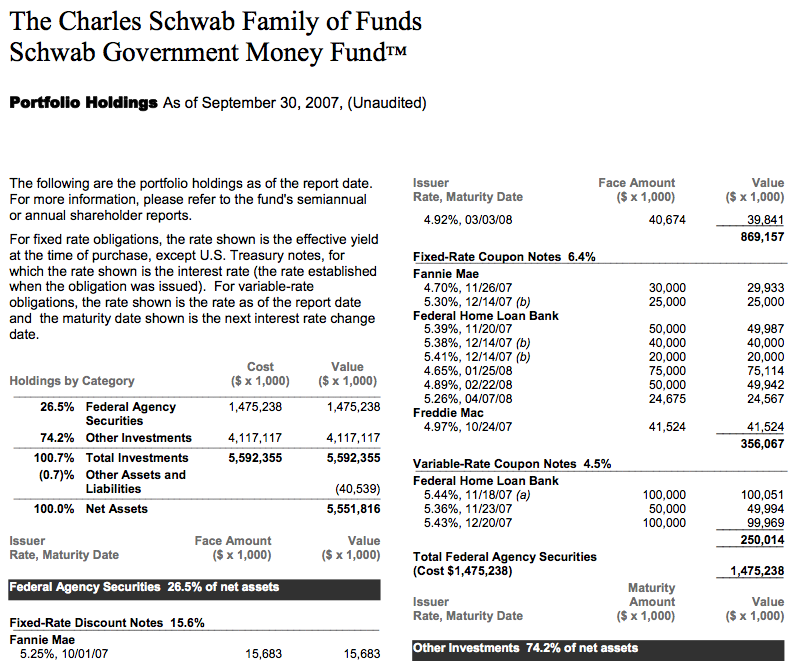 Schwab is essentially using this money market as a fee mill, charging annual management of expenses of .75 percent, not including other hidden turnover related fees. Fees for such a fund should not exceed .25 percent. More astute financial watchers might also ask, why are Fannie Mae and Freddie Mac obligaitons listed as government securities when the Treasury has reapeatedly stated that they are not backed by the government. Such holding would be ideal for a regular money market but not a government money market. 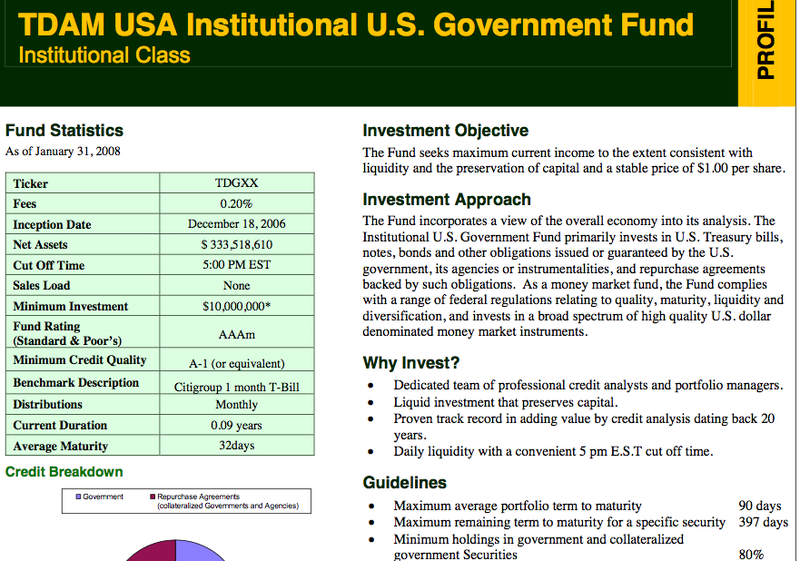 Another leading discount broker, TD Ameritrade, uses the following to summarize its “government money market” fund. Note that the benchmark is “Citigroup one month treasury.” How ridiculous is that when Citigroup is clearly bankrupt? In TD’s defense, their government money market is better diversified and charges lower expenses than Schwab’s. In a previous blog post I noted that Joe Moglia, CEO of TD Ameritrade, should be replaced by Tom Bradley. Bradley is a highly competent person of integrity that came from the TD Waterhouse side. Moglia, on the other hand, like many top execs today is making an obscene level of compensation, tens of millions, and betraying both investors and employees. Many outstanding TD Waterhouse employees lost their jobs due to Moglia’s greed obsession when the merger with TD Amertrade occurred. Moglia is a stock peddler that should be “dismissed” because he clearly does not have the competence or integrity to run a leading diversified financial firm like TD Ameritrade. In any event, that was my direct comment to his boss, Ed Clark, CEO of Toronto Dominion, TD Ameritrade’s parent organization. Numerous clients maintain accounts at TD Ameritrade. If we are going to restore integrity and stability to our financial markets, such tough decisions must be made, in my opinion. Do also see related youtube video describing this situation by searching youtube for parishinvestments.